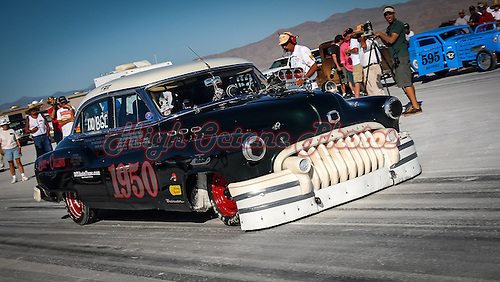 The Photo of the Day today is Richard and Mike Collison's 1950 Buick Straight Eight, at the SCTA's Bonneville SpeedWeek 2010. This car was built with a little help from Gary Hart and sponsored by DIYAutoTune.com. The teams SpeedWeek 2010 campaign was cut short by a couple of holes in the block courtesy of the number 2 con rod. As you can see here, this is one beautiful race car, and hopefully still ready to race, although I can't find any mention of it on the salt much after 2010.